He doesn’t seek attention. Doesn’t celebrate every play he makes. All he does is make tackles, and make them at a rate rarely seen at Washington in the past three decades. “College football, there’s a ton of snaps, offenses go fast, so you end up playing 65, 70 snaps a game on defense and a lot of teams like to run the ball so if you’re playing linebacker you’re going to get a lot of tackles,” Burr-Kirven said. Burr-Kirven will be incredibly important Friday against No. 7 Washington State in the Apple Cup with a berth in the Pac-12 title game on the line. 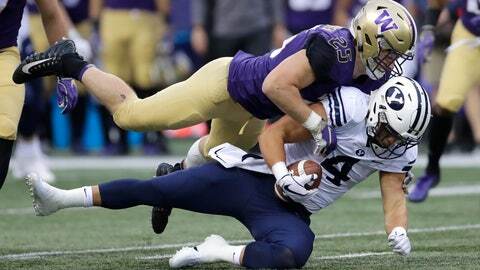 With the way the Cougars use running backs James Williams and Max Borghi out of the backfield, and the amount of underneath routes in the passing game, Burr-Kirven is likely to be busy trying to make tackles in space. That means adding to his total of 145 tackles through 11 games. That’s second-most in the country, and he’s likely to take over the top spot with UMass linebacker Bryton Barr, who has 147, already completing his season. Barring something unexpected, Burr-Kirven is going to have more tackles than any other Washington player since 1989. Mason Foster had 163 in 2010, but he’s the only one to come close to James Clifford’s total of 168 in 1989. Clifford’s total came toward the end of an era where multiple players could be awarded a tackle on one play. Rules were changed to where a maximum of two players can be awarded a tackle on one play, and players getting to 100 tackles in a season became an accomplishment. Which makes what Burr-Kirven is on pace to accomplish even more remarkable. If he stays with his average through 11 games, Burr-Kirven could finish the season in the neighborhood of 170 tackles. It’s also a remarkable total considering he plays on a defense filled with several future NFL draft picks. Burr-Kirven has more tackles than the next two players on Washington’s defense combined. His current total is 61 more than he recorded last year as a junior, when he led Washington in the category. Frank Ginda of San Jose State led the country in tackles a year ago with 173, but he is the only player to reach at least 170 since Luke Kuechly had 191 tackles in 2011 to lead the country. If the Huskies beat Washington State, they would get an extra game in playing for the conference title for Burr-Kirven to add to his total. And while he’d be unlikely to reach Kuechly’s number, it’s not completely out of the question. Part of the reason Burr-Kirven has so many tackles is the structure of Washington’s defense and the fact he doesn’t miss. Washington’s defensive line regularly eats up blockers, giving Burr-Kirven the freedom to make the stop. It also helps that teams have been leery of throwing heavily against Washington’s secondary. The more run plays, the more chances for Burr-Kirven.